Kata kunci: Islamic movement, fundamentalism, secularism. This article describes Karen Armstrong’s view on the Muslim fundamentalist movement in modern century. For Armstrong, Islam experienced modernity (particularly in Egypt, Pakistan, and Iran) aggressively. The last movement of Islamic modernization is a movement of fundamentalism. Fundamental-ism is a movement which aspires to the condition of the Islamic past to actually go back to the pure Islam. However, for Armstrong, most of Islamic fundamentalism is radical and extreme. This is caused by the initial modernization in Islam that looks moderate and not passionate which apparently was not satisfactory for Islam itself. In addition, in her analysis, fundamentalism is the impact of imposed secularism in Islam. Although Islamic fundamentalism runs with conservative spirit, the characteristic of their ideology is modern. At least they have been influenced by Western civilization. Muslim fundamentalists have formulated a creative and innovative ideology to make changes. al-Jilani, Abdul. 2014. 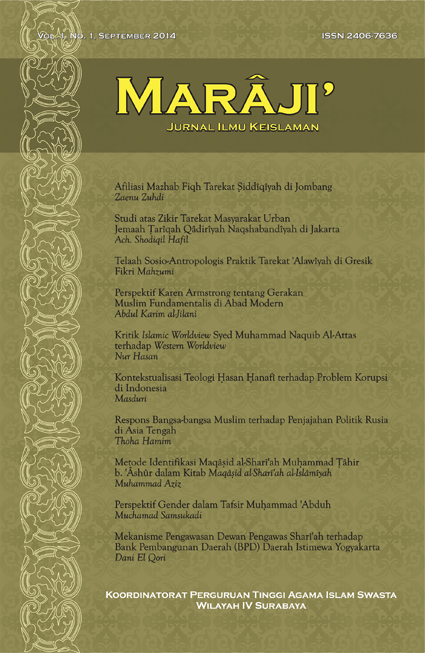 Marâji`: Jurnal Ilmu Keislaman 1 (1), 81-114. Accessed April 25, 2019. http://maraji.kopertais4.or.id/index.php/maraji/article/view/12.